This dresser is 6 ¾" tall and 3 ½" wide. 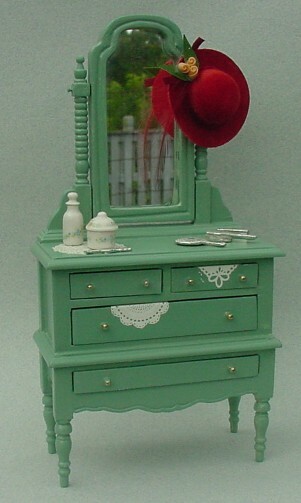 A felt hat hangs from the mirror. A perfume bottle, powder box and silver dresser set decorate the top and it looks as though a couple pieces of linen are hanging out of the drawers! By Delila Rimmel.